Wandelbar are a pan European artists collective and networking group primarily based in Switzerland. They are a peripatetic organisation, directed by Marc Rome and Harald Reichenbach. This exhibition is part of a larger tour to Celtic countries, including Limerick in Ireland, Selkirk in Scotland and, of course, Wales. 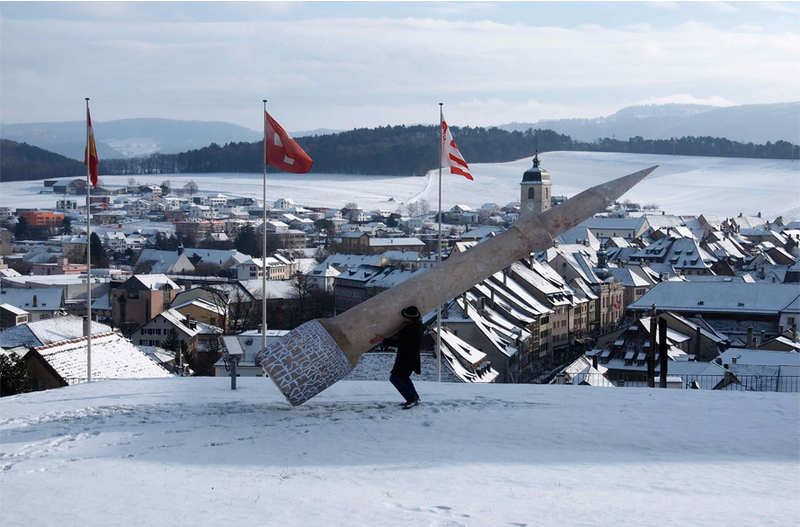 It is aimed at broadening an understanding of Swiss art and to help introduce these artists to a wider audience. The exhibition takes the motif of the mountain as a point of departure and invites visitors to explore notions of time, scale, stillness and movement. The artists use functional materials and simple techniques to explore the rhythm of the landscape, creating a suite of playful, interactive, contemplative or meditative artworks. The artworks involved in this exhibition range from painting, to sculpture and installation. The majority of these artists are from Switzerland, with others coming from Spain and Wales. They include: Max Roth, Harald Reichenbach, Andrew Cooper, Zimoun, Nicolas Berniere, Paco Simon, Chris Kettle. Also to be viewed is Gstaadfilm a record of the bi-annual international film festival of artists films, which is directed by Marc Rome.